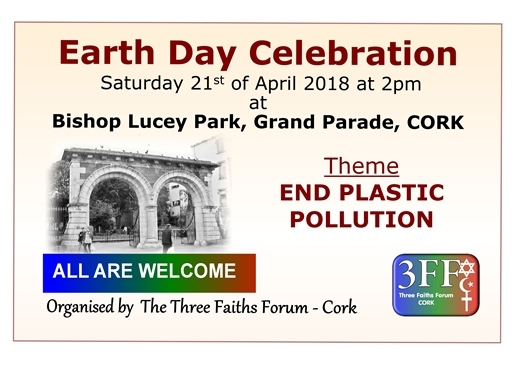 The Three Faiths Forum (3ff) is organizing an Earth Day event in Bishop Lucey Park, Cork, on Saturday 21st April, starting 2PM. All are welcome. The SMA and OLA were, along with representatives of the Jewish and Muslim faiths and other Christian denominations, founding members of Cork’s Three Faiths Forum. The Earth Day event last year was 3ff’s first public event and was a great success. Hopefully this year’s event will be also. You may view our flyer about this year’s event by clicking here. We would appreciate your support in making the leaflet and the event known to all your members and by encouraging them to attend. Cork, in the ‘new’ Ireland of the 21st century, has become a multicultural, multiracial and multireligious society. For the past two years a group drawn from the Jewish, Christian and Muslim faith communities in Cork has been meeting to explore how these communities can help foster a spirit of openness, dialogue and inclusion within our society. The Three Faiths Forum began in London in 1997 Soon after it began in Dublin and now a group has formed here in Cork. The Forum is an initiative that brings together representatives of the three Abrahamic faiths – Judiasm, Christianity and Islam – and seeks to create a space where people of faith can dialogue openly and respectfully, come to a better understanding of each other’s faith and work together to enhance tolerance, co-operation and friendship in society.